Ruined is the right title for this play. The word ‘ruined’ is not only used as a euphemism for the horrific sexual violence perpetrated on women, but it’s also an appropriate word to describe what is happening to the farms, the land, the communities, and the families caught in the crossfires of the civil war-torn Democratic Republic of Congo. While there are very few moral victories in this play, we do find that there are certain things that cannot be ruined, such as the spirit and fight of those people who are fighting to survive under impossible circumstances. Before its inaugural performance in 2008 at Chicago’s Goodman Theatre, playwright Lynn Nottage and original director Kate Whoriskey traveled to Uganda to interview women to give themselves more accurate context on which to base the play. 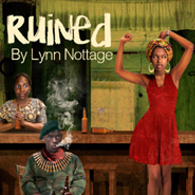 Ruined is set in a small mining town in the Democratic Republic of Congo, and more specifically in the small, unassuming and all-welcoming local bar and brothel run by Mama Nadi. At a hefty 150 minutes running time (not including intermission), this is a challenging play for the commanding role of Mama Nadi (played unforgettably by Mariam Barry). A shrewd businesswoman, Mama does what she must do in order to survive - from watering down the whiskey to compromising her friendships and her own morals. The set design by Carolyn Rapanos is a simple rustic bar with cheap tables and aluminum siding. The space feels vulnerable, open and unprotected, which reflects the danger that is constantly threatening Mama Nadi and her girls. The live music performed at Mama’s establishment is lovely, honest and pure, sung shyly at first by new girl Sophie (played by a formidable Makambe K Simamba), and then louder and more confident throughout the play as Sophie rises above to fight against her trauma and intended fate. Shayna Jones and Rachel Mutombo play Salima and Josephine, two women at Mama’s house who tell their stories with resilience and anger, hopelessness and shame. Amidst themes of pride, violence, and power, the greatest take away is that these women are survivors who continue to fight against the war that is being waged, often on their bodies. The characters in this play are not black and white. Especially Mama is imperfect, flawed and complicated. In the face of unflinching aggression, the fight to survive often negates altruism. Yet Mama is a sympathetic character – she is likeable. She is protective of Sophie in spite of (perhaps because of) the fact that she has been “ruined”; after all, Sophie’s spirit and fortitude are far from ruined. These are smart women. They do not lay down or give up.